Sadly passed away on 18th March. 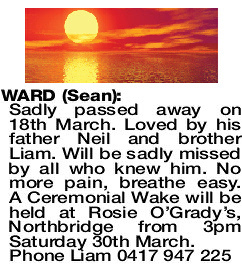 Loved by his father Neil and brother Liam. Will be sadly missed by all who knew him. No more pain, breathe easy. A Ceremonial Wake will be held at Rosie O'Grady's, Northbridge from 3pm Saturday 30th March.